Fresh off winning a World Series ring with the defending champion Chicago Cubs, Aroldis Chapman hit the free agency market seeking the largest contract ever given to a relief pitcher in Major League Baseball history. He ended up getting just that – agreeing to return to the New York Yankees on a five-year, $86 million contract which includes an opt-out after the 2019 season. The contract will keep the soon-to-be 29-year-old in Pinstripes through his age 33 season, if he elects not to exercise the option. Many saw the Yankees primary needs this offseason in the starting rotation as well as depth at the corner infield and outfield spots, however, Brian Cashman chose to bring back the man with the 105 mile per hour fastball to tandem with Dellin Betances at the back end of the Yankees' bullpen. The key criticism with the Chapman signing was why the Yankees chose to add depth to their bullpen when they have a shaky starting rotation that might not be able to hand many leads to said bullpen later in games. We here at the BBB, however, have always noted that the Yankees biggest strength last year – as well as what they now project for 2017 – is their bullpen. I like to use the 2014 American League Champion and 2015 World Series Champion Kansas City Royals as the biggest example in favor of why the Chapman signing was a spot on decision. Those teams featured such starting pitchers as James Shields, Kris Medlen, Jason Vargas, Chris Young, Jeremy Guthrie and Edinson Volquez. Aside from the mid-season acquisition of Johnny Cueto in 2015, not a single name on those staffs jumped off the page, yet the Royals managed to take the Giants to seven games in 2014 and won it all in 2015. Of course, the Yankees don't have the roster depth that those Royals did, but those teams were living proof that a lethal back-end of the bullpen can absolutely be a difference maker. With Chapman in the fold for the upcoming season, the Yankees, who will largely feature a roster of youth and inexperience, should still be able to compete for at least a Wild Card spot. The Cuban Missile missed the first 30 games of the 2016 season after he was hit with a suspension under Major League Baseball's new Joint Domestic Violence, Sexual Assault and Child Abuse policy. The suspension was connected to an event from October 2015 in which he allegedly choked his girlfriend and fired eight shots from a handgun in the garage of his home in Florida. Ultimately, charges were not filed, but the dark cloud cast by the event led to Chapman's decreased value on the trade market (after the Los Angeles Dodgers nullified a deal they had in place to acquire the lefty prior to the Yankees trading for him) as well as the aforementioned suspension. Aroldis Chapman is, of course, a pitcher that relies on raw velocity with his fastball as well as a strong secondary pitch – a slider – to find success. Chapman's ability to hit triple digits with regularity is so incredible that MLB Statcast even has a "Chapman Filter" on their "Fastest Pitches" page. Chapman threw the 29 fastest pitches is baseball last season en route to 4-1 record with 36 saves, a 1.55 ERA, 0.862 WHIP, 14.0 K/9 and an incredible 273 ERA+ which measures how a player compares to the league average player at his position. To put his ERA+ number into perspective, he was almost three times as dominant as Major League Baseball's most average relief pitcher. That's simply incredible. Chapman did show some signs of mortality in the World Series with the Cubs, however, Joe Maddon's overuse of him throughout the playoffs can certainly be to blame, as Chapman was on multiple occurrences asked to pitch two or even three innings at the end of games. The Yankees should expect him to return to the form he displayed last season in pinstripes. 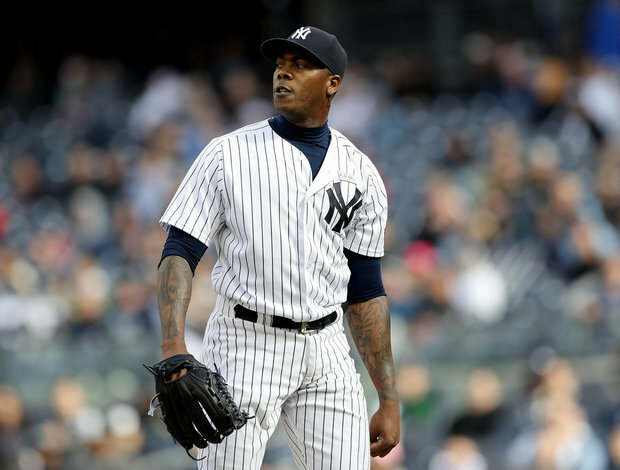 Chapman will face no competition from anyone in the Yankees bullpen for the closer role this year, as well as for the foreseeable future. He will still be just 29 years old at season's start so it's safe to say the Yankees have at least a few more years of Chapman dominance on their hands free of concern of potential diminishing velocity. ZiPS Projections see Chapman appearing in 59 games and throwing 57.1 innings with 95 strikeouts, 23 walks and only 15 earned runs allowed. Steamer projections currently forecast Chapman to record a 4-2 record with 35 saves over 65 innings pitched, with a 2.28 ERA, 0.99 WHIP and 104 total strikeouts. As long as the Yankees can get the same or close to the same Aroldis Chapman in 2017 that they had in 2016 (31.1 IP, 2.01 ERA, 12.6 K/9, 5.5 K/BB), then they should be just fine. The biggest concern with handing Chapman the ball late with a lead is with the starting rotation and the ability of the offense to put runs on the board, however, with an exciting young team and a dominant 7-8-9 troika of Tyler Clippard, Dellin Betances and Chapman, the lefty closer should have plenty of opportunities to put Ws on the board. Aroldis Chapman will surprise nobody in 2017, but considering the dominant consistency he has shown since his major league debut with the Reds in 2010, that is exactly what the 2017 New York Yankees need.